Today I am so happy to be showing you some amazing dresses from Sisjuly, a new retro and vintage inspired brand. For the first dress, we were out at Royal Old Town on the East Coast of Koh Lanta. We had a lovely time exploring ~ I’ve been there a few times now, but every time I love it! This particular day we got to take a closer look at at the Chinese Shrine that has been standing in the heart of Old Town for well over a hundred years. Koh Lanta’s Royal Old Town is such an interesting place ~ once a major port for boats running the China and Arabia to Malay routes, Old Town became a busy place of trade. Many of the original structures and Chinese long houses can still be found in the area. When the trade increased, further settlers came too and this is the reason for why Koh Lanta has such an eclectic mix of cultures on such a relatively small island. With Chinese, Arabic, Muslim, Thai and Sea Gypsy influence, it is a melting pot of rich traditions. The Western side of the island wasn’t developed until much later, and the middle of the island is mostly untamed jungle! You can get a lovely taste of wild life down further south on the island, with monkeys and more! Which brings us to the next location ~ the lighthouse at Koh Lanta’s National Park. Fairly old and crumbly, I honestly couldn’t tell if the lighthouse was working at all except that there still seemed to be some sort of generator outside with cables running into the top of the lighthouse. And yep, that’s a giant hole in the concrete platform! Also, there was no real way to get up to the lighthouse without scrambling up a rather steep and rough cliff hill! But I must say, the dress handled the hike very well, I was so happy to get up there without any incidents! Between the two dresses, I can’t really decide which one I like best ~ the cherry print is super fun, but I’m also such a fan of the white and navy nautical print… And both styles are really nice, I love the 50’s feeling of the cherry dress and the 40’s impression from the second frock, so?? I have been really impressed with the quality of the Sisjuly pieces, as I hadn’t heard of the brand until they reached out to me last month. When I went to have a look at their shop I was so excited to see a huge range of retro and vintage inspired pieces! The dresses come in all kinds of prints and styles, and I was keen to try them out and see how they looked. The fit has been good for the pieces I ordered ~ I think that it is as it has been as described in the sizing charts, which is always important when purchasing online. It’s probably exact, so if you were to fall in between a size I would definitely suggest sizing up to allow for wearing ease, or if you like a looser fit. The fabric also comes in a variety of finishes. Some of the dresses have very thick fabric, which is perfect for cooler months, and others have been lighter. As we are traveling through tropical countries at the moment, obviously I am a huge fan of the light weight fabrics! But even while the two dresses I am wearing in these pictures are on the thicker side, they still where quite comfortable to wear on cooler, cloudy days. The quality of the make is great ~ I absolutely love the longer, vintage appropriate lengths of the skirts, and when they are designed as a full style, they come as a full style which is very important to me! I get so excited when a new clothing brand comes onto the scene that has a wide range of vintage inspired pieces, and it’s great when they are super affordable! 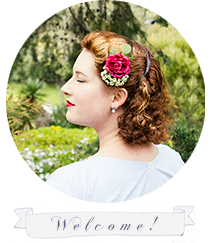 I have found their customer service to be really friendly and helpful, as Sisjuly are passionate about their vintage and retro style, and their service reflects that. I was also very pleased to hear that they really care about how the dresses are made ~ from dedicated in-house designers to fair pay for all their workers. If you want to find out more ~ Sisjuly have a Facebook page where you can follow along for more updates on their latest releases and vintage inspiration. In the mean time, I hope to share more from this brand in the future, so keep look out for further vintage inspired styles!